The morning of this year's Worthing Seafront Bus Gathering dawned with strong winds accompanied by continuous rain which didn't abate until early afternoon. The event was held on Sunday in conjunction with the Worthing sea front festival, although almost all the other events were cancelled on the day! However, well over twenty vehicles arrived and it wasn't until mid afternoon before I braved the elements to see what was on view. The first bus of interest was former Stockport Corporation East Lancs bodied Leyland PD3 MJA895G. It was one of 27 purchased during 1968/69 with the last six built with forward entrance. It was withdrawn from service in August 1981 and, after many owners, it was acquired for preservation by Chris Pearce who is hopeful of restoring it to its original state. A bus of local interest was East Kent Marshall bodied Leyland Leopard 673 273AUF. Whilst it was new to Southdown in 1962 (then went to East Kent), it also spent sometime in service with Suffolk independent Rules of Boxford who had acquired it from Galloway. Leyland Titan PD2/37 23ACO was new to Brighton Corporation in January 1963 which, despite being front-engined was Britain's first one-man-operated double-decker. Although not built as such, its Weymann forward entrance body was adapted to allow the driver to take fares awkwardly through the bulkhead window! Another local link was provided by former Eastern Counties Bristol RE849 RPU869M which was, at one time, a temporary resident at the Carlton Colville. The current owner is a 70 year old lady who keeps it (and a Bristol VR) on the road by working for Stagecoach Hastings. As expected, former London buses were attracted to the event including RF486 MXX463. The Metro Cammell bodied AEC Regal IV was new to Muswell Hill garage in February 1963. Following uses as a staff bus in the 1970s, it was finally sold into preservation to Paul Brophy in August 1977. 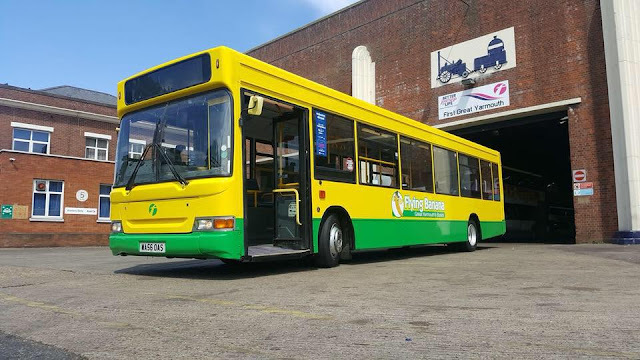 It has appeared at many running days in the south east and also at Showbus in the late 1990s. During the last week, or so, we have added more up to date fleet lists to the blog. These can be found by clicking on the navigation bar below the header photo. 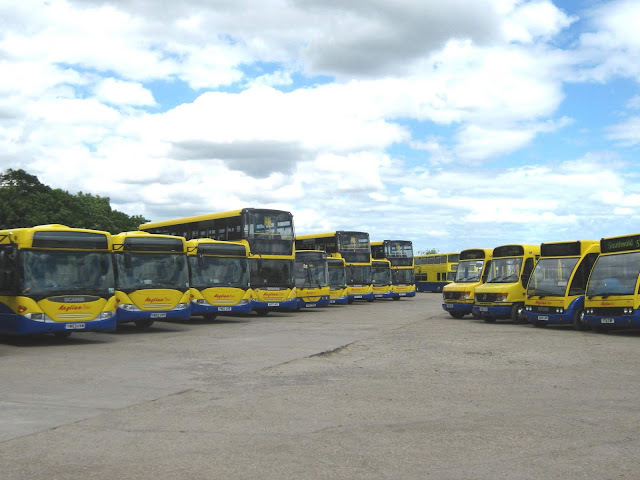 The latest are those for Reynolds Coaches, Sanders Coaches and Wrights Coaches (PTS Group) The first named will cease operating on the 31st July 2018 with assets being auctioned off next month. My thanks to the staff at all three operators for providing the information. 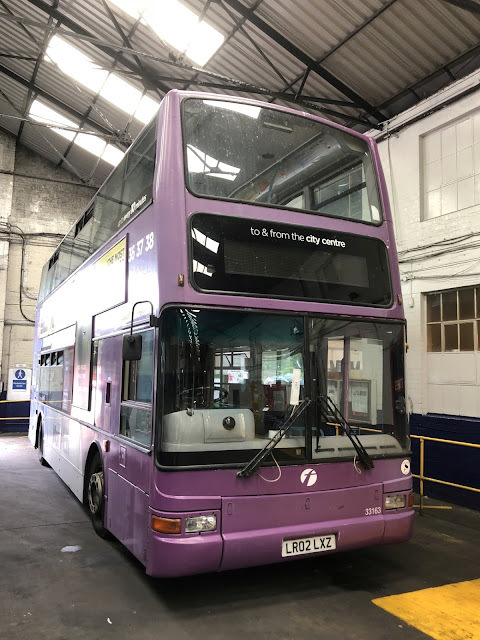 The latest news from First's Caister Road depot is that Wright Eclipse Gemini 37573 AU58ECX is off the road with an engine fault. 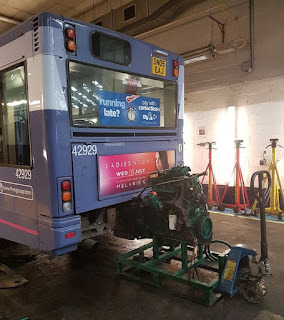 Plaxton President bodied Volvo 32212 LT52WTV has had its gearbox fault repaired and is now back in use. Also returned to service is Wright StreetLite 47503 SN64CPX following a window repair with 47501 SN64CPU receiving similar attention. Volvo B12M 20514 WV02EUP has returned to Caister Road for driver training purposes. Just the one local item of interest in today's Notices & Proceedings Report prepared by the East of England Traffic Commissioner. 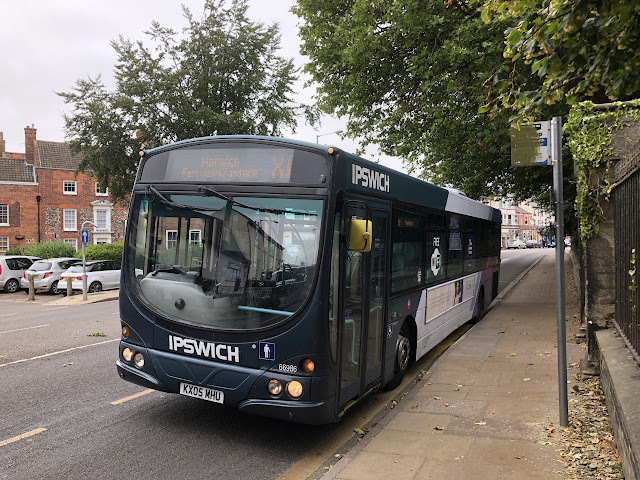 It relates to an application for a PSV Operator License made by Victor Damski of The Ravine in Lowestoft for an operating centre at 115 Whapload Road in the town. 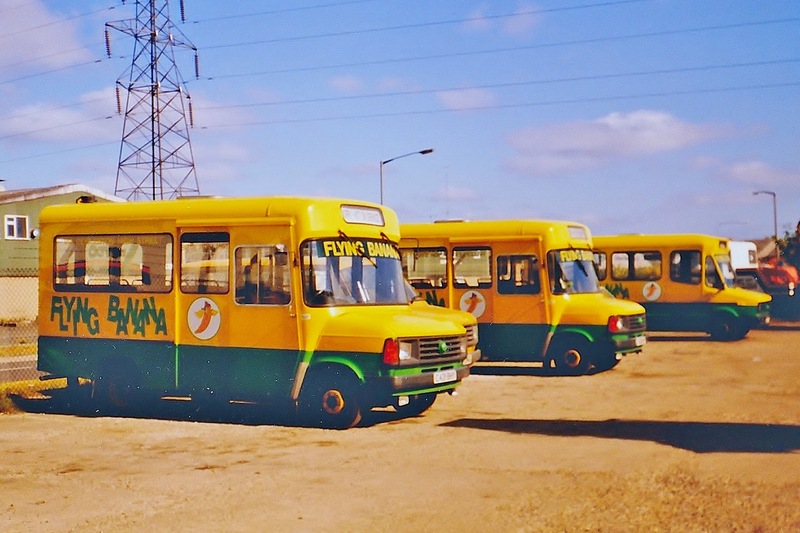 They began the route with three minibuses which are shown above at their then Harfrey's Road base. They were, left to right, ex Bristol Ford Transits C431BHY and C430BHY, plus former Strathclyde Freight Rover Sherpa E237VOM. Great Yarmouth's Beach Coach Station contained a total of eleven when passing at lunch time today.. The most notable vehicle was this Berkhof Excellence bodied Scania K113TRA with the cherished NIB8179 plate. It is operated by Ausden Clarke of Leicester with the legals showing Belgrave Car & Commercial Limited. Also present was Commercial Coaches' Volvo B12B PO59FHY (working for Alfa Travel) , Gee-Vee Travel's VDL GT16GYT and West Row Coaches Scania W914BEC. The first shows Dennis Trident/East Lancs 712 (T812RFG) turning from Colchester Road in to Long Road in Lawford on 5 July, returning to Clacton depot after working a school contract to Manningtree High School. 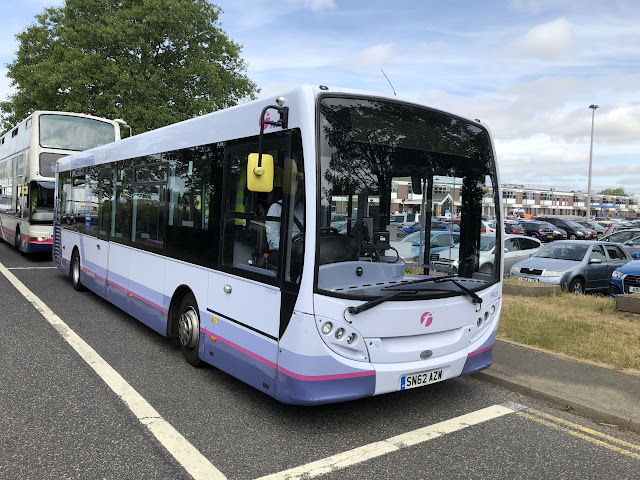 Next is Scania Omnicity 850 (AO57 EZM) in Jackson Road, Clacton, on 6 July on the 135 Clacton - Great Clacton Circular, in between am and pm school contract journeys. 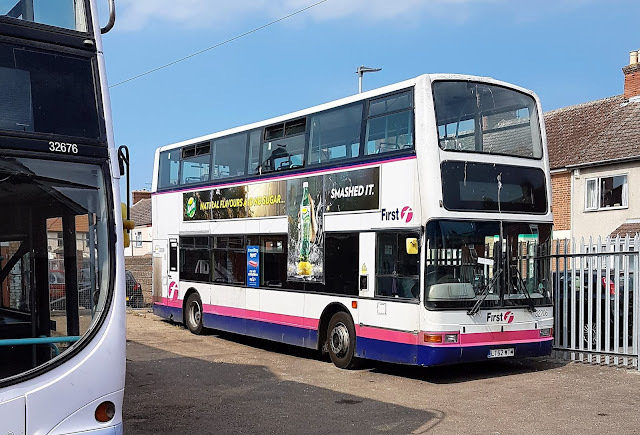 Finally, Scania Omnicity 852 (AO57HCD) is shown in Station Road, Clacton, on 6 July, working service X76 Colchester - Clacton - Jaywick. My thanks to Robert for the information and photos. Blog readers may remember that earlier in the month we reported the transfer of Excel liveried ADL Enviro400 33819 YX63LKG from Lowestoft to Kings Lynn. I regularly read your blog linking through from Plymothian Transit and was interested in seeing your picture on Thursday of 33156 in Weymouth. As Traveline Data Coordinator for Dorset, Weymouth is a big part of my patch, and I can add more information to your post. Slowcoaster only ran for one season, in 2017, and was unsuccessful because it was as the name implies a very slow way to traverse the Dorset coast. It ran in and out of a number of holiday camps en route and never generated the business hoped for. At least two buses received the livery, the other also being second hand 33146 LR02LXB and for the 2018 season they are usually in service on the 502 to Littlesea Holiday Park, or the 4 to Preston which needs double deck buses in summer as it passes Weymouth Bay Holiday Park. At the end of the summer they are likely to lose all the lettering but retain the yellow and brown base colours as these are also used for the Jurassic Coast liveried buses. I don't know if 33146 was also in Norwich at some point (It was!) but I am attaching a photo I took of it on 5 May 2018 working the 502 to Littlesea. It's not the best shot but it managed to capture the destination which is not always the case. David Burdett sent in this shot of a former First Norwich Dennis Trident in Weymouth on Saturday last. It is of First Wessex 33156 LR02LXP which was observed in its latest Slowcoaster livery. It was new to Centrewest London Buses in June 2002 as their TN33154. It then went to First Eastern Counties in April 2010, prior to moving to First Hamsphire & Dorset (First Wessex) at the beginning of 2017. The Slowcoaster ran from Weymouth to Bridport, via Portland, visiting various tourist attractions and camp sites on the way. Photo Op ~ Time for a Wash! 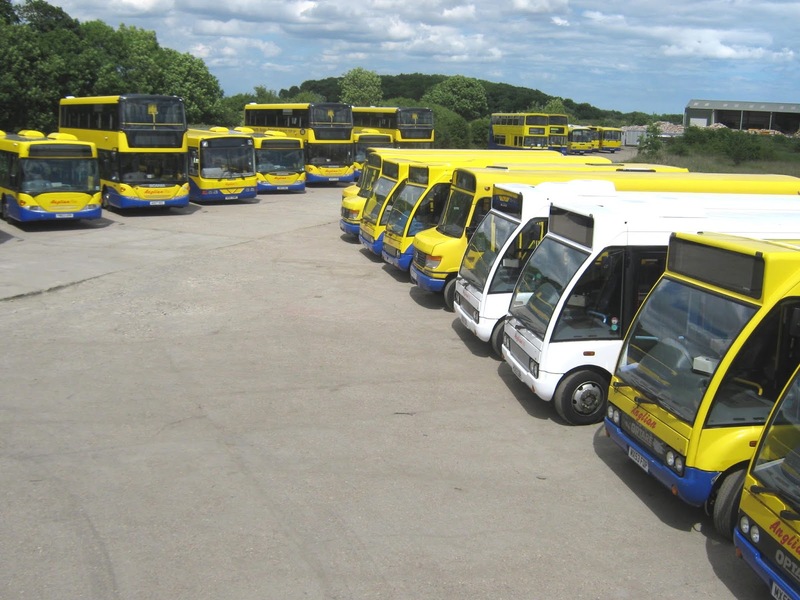 The latest from Caister Road is that the First Great Yarmouth Darts have now returned to service. 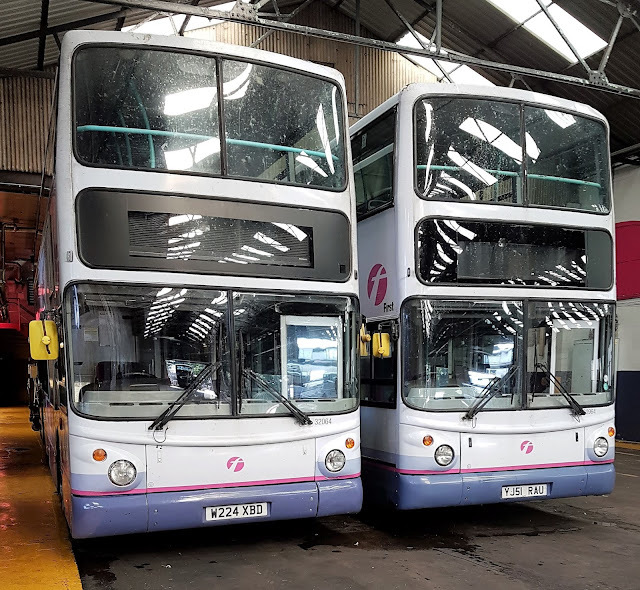 Both 42921 EU05AUN and Flying Banana 42943 WA06OAS are now back on the road with re-engined 42929 expected to follow by the time you read this. 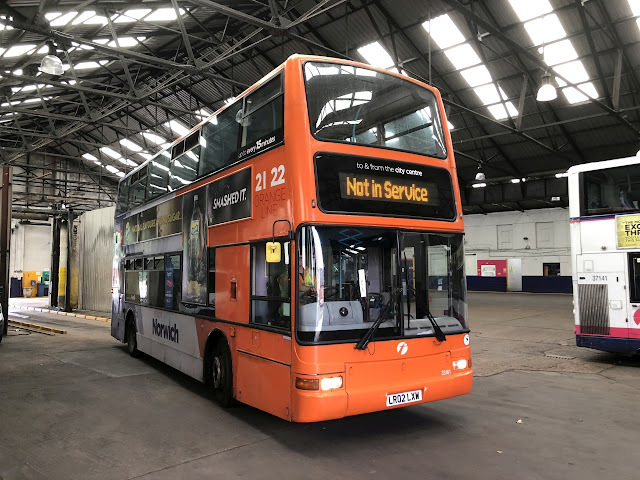 Decker wise, 32676 SN55HFD is back in use whilst the efforts to return 32206 LT52WTM to active service is taking a little bit longer! 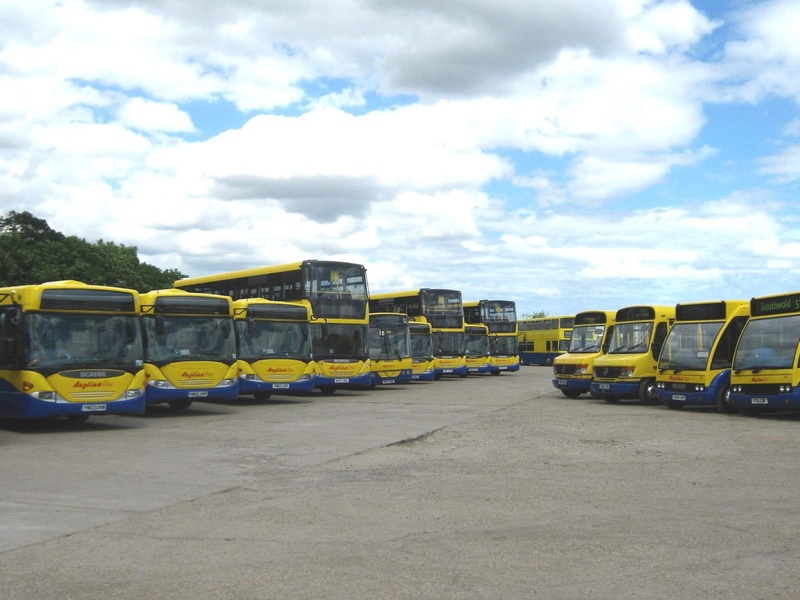 This morning's Notices & Proceedings Report, published by the East of England Traffic Commissioner, records the surrender of an operator licence held by a well known bus service provider. With effect from 5th July 2018, Anglian Bus Limited, surrendered its licence bringing a final end to the business established way back in 1981 by David and Christine Pursey. The entry named the directors as David Brown, Martin Dean, Simon Butcher, Jeremy Cooper and David Golding. The photos show the Anglian Bus Ellough site on 11th July 2010 (yes, exactly 8 years ago!) when it was especially opened to enthusiasts in connection with an event at the East Anglia Transport Museum. A Busy day at Caister Road today saw a few visitors to the depot for MOT and inspection work from other FEC garages. First up is Norwich Trident 33161 LR02LXW, a member of the Orange Line Fleet. Next up is Lowestoft Enviro 200 44532 SN62DBO for MOT. 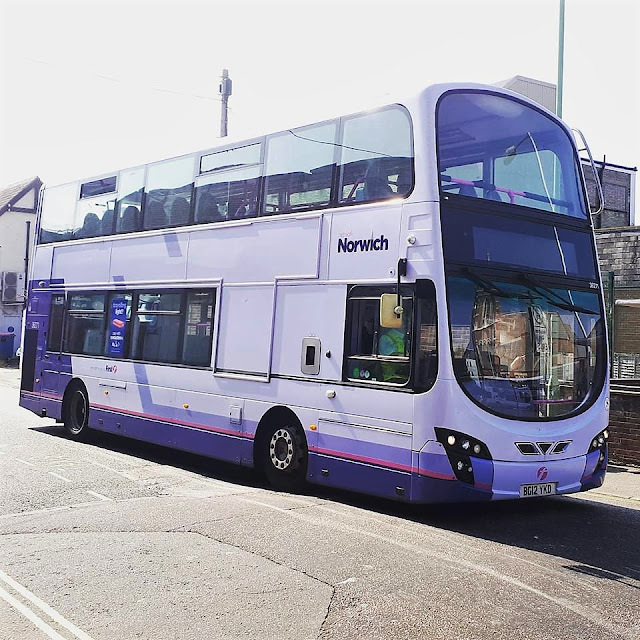 Another Norwich visitor is Purple Line branded 33163 LR02LXZ. Finally Ipswich based Volvo B7RLE 66986 KX05MHU also appeared here today and was noted this afternoon working the X1 to Norwich. Many thanks to Will Drake for the photographs from Yarmouth and to Kieran Smith for the Norwich Bus Station Photo. As to be expected, coaches working for the National Holidays and Alfa Travel operations were on site. 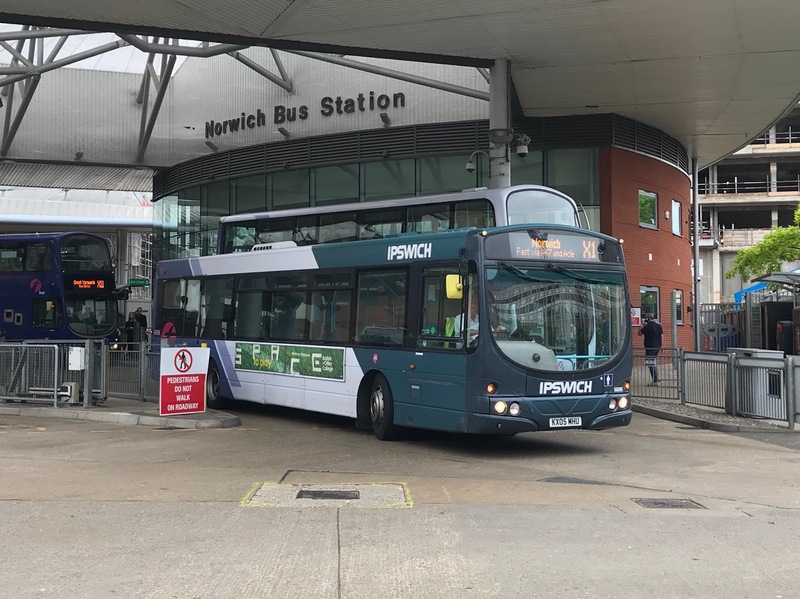 The former was represented by Setras NH10MSH and NH11STH whilst Commercial Coaches' Volvo B12B PO59FHY was operating on behalf of the latter. However, surprising was the appearance of Coaches Excetera's Mercedes Benz Tourismo BX64CZY. At around 5 pm this afternoon Beach Coach Station was playing host to two 18 plated Mercedes Benz Tourismos. 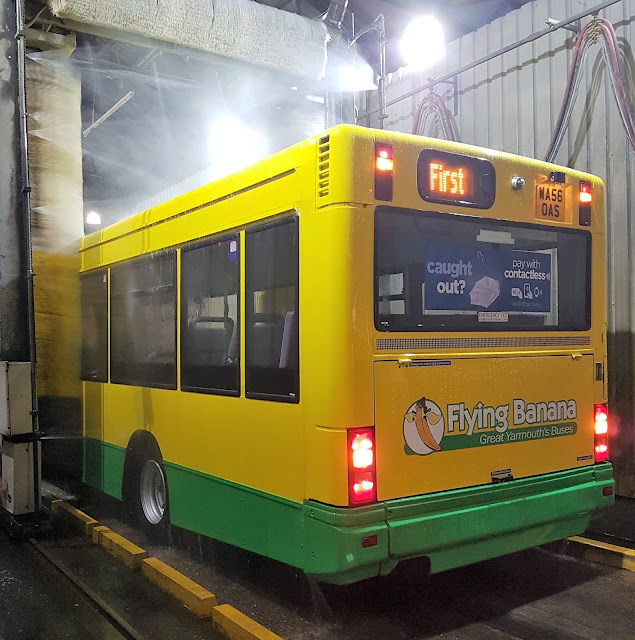 The Flying Banana Bus Company was taken over by First 20 years ago this year and to commemorate the event, First have repainted Dart 42943 WA56OAS into the eye catching Yellow and Green livery of the former independent company. The company at the time ran a fleet of Ford Transits, Leyland Sherpa & Dodge minibuses before moving on to a fleet of ex London and Essex Mercedes Benz minis and a couple of brand new Mercedes Benz Varios were also purchased whilst operating in the town. Many thanks to First for the photograph. Regular contributor Will Drake has sent us some photos from today whilst out and about around the town. First up is Lowestoft Enviro 44531 SN62AZW which is on loan to Yarmouth and was noted at the James Paget Hospital this morning working the 8 service to Caister. Next up is another loanee 36271 BG12YKD from Norwich which is also on duty from Yarmouth, noted this morning at Caister Road about to work the X1 service to Norwich. 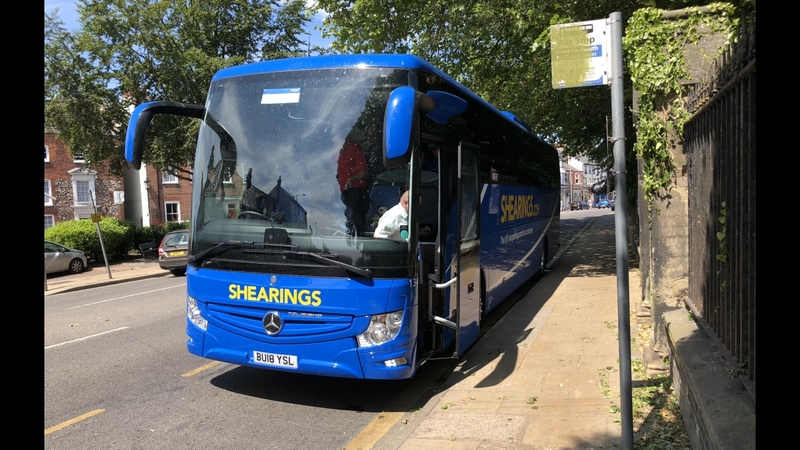 Finally, another of Shearings 2018 deliveries was noted in Northgate Street dropping visitors near St. Nicholas Minster. BU18YSL is a Mercedes Turismo in the new company livery. Many Thanks to Will for the Photographs. Regular contributor Kevan Portas reports on the latest arrival at Rollesby-based Jubilee Coaches. Just the one retrospective entry to record from this morning's Notices & Proceedings Report published by the East of England Traffic Commissioner. 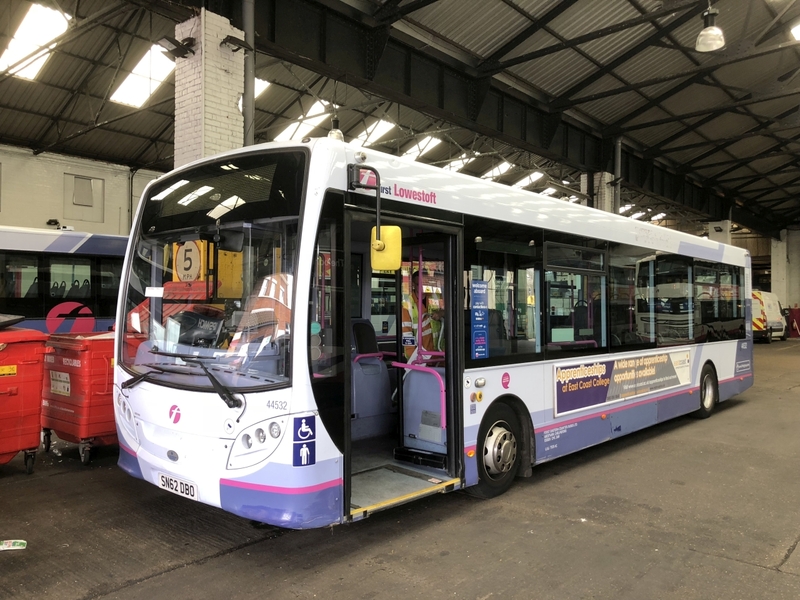 It concerns an application granted under short notice for a park and ride service provided in connection with further filming work for the latest Danny Boyle film based in Gorleston. It ran from Beacon Park to Gorleston Cliffs on 27th June 2018. My thanks to First for providing the latest information on local vehicle movements in the fleet. 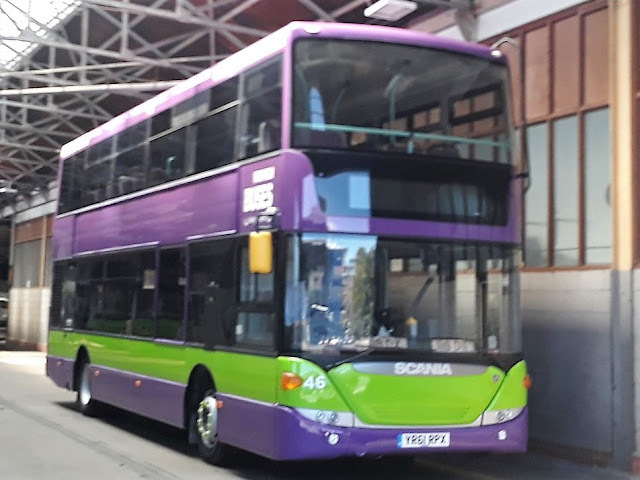 The first involves the transfer of Excel liveried ADL Enviro400 33819 YX63LKG from Lowestoft to Kings Lynn. 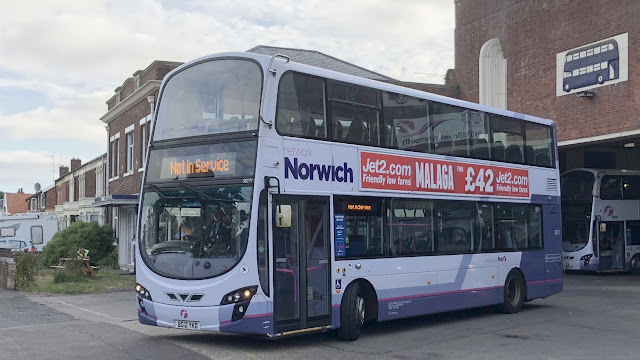 Regarding Caister Road, Plaxton President bodied Volvo B7TL 32205 LT52WTL has gone to Norwich being replaced with 36271 BG12YKD which had moved to Norwich from Leeds only a few months ago. It was new to First Games Transport in June 2012. Yesterday's North Norfolk Railway's Vintage Bus Day attracted a few vehicles and I was fortunate that Mike Sayer has sent photos of some of the attendees. Most of the photos were taken in the display area adjoining Holt Railway Station although one was taken at Sheringham. First up is this one of an AEC Regal 3 with a Duple full fronted body. HHP755 was formerly with Greenslades Tours of Devon and was new to Maudslay Motor Company as a demonstrator in September 1948. Mike's second photo is that of Eastern Coach Works bodied Bristol LS6G OTT43 which was delivered new to Western National in August 1953. It was used on their Royal Blue express services which were operated jointly with Southern National. London Country liveried Routemaster RML2419 JJD419D also made an appearance. The decker was new in February 1966 being sent to Aldenham Garage. In 1998 it was acquired by Metroline with withdrawal following in March 2004. It was purchased for preservation soon after and later privately acquired in October 2009 being based in Norfolk. Mike's main reason for attending was to be reunited with former Huddersfield Corporation Daimler CVG6 HVH472D. This was a bus that he last drove 44 years ago!